We’re through the majority of NFL free agency now. There will still be signings, releases-and-signings, and player moves regularly between now and training camp, but we know where the majority of NFL veterans will be in 2019, and we can plan for fantasy football accordingly. So with that in mind, let’s turn our eyes forward. We’ve seen values shift in players like Le’Veon Bell, Golden Tate, and Nick Foles in free agency this offseason, so let’s start considering who could see their value move in 2020 because of their own free agency. This can just be something to file away, or for those in keeper/dynasty leagues, it can give you an idea of players to buy or sell ahead of time. Today, quarterbacks and running backs. Saturday, wide receivers and tight ends. The first thing to remember is that (generally speaking) free agent quarterbacks who are worth a lot are unlikely to change teams, and (generally speaking) ones who do change teams do so because of their own flaws. Sometimes you can get a Drew Brees in free agency, but most often you are getting a Case Keenum. Still, it’s worth taking a look. Anything can happen, but if we ever see these quarterbacks as a full-time starter for any team other than the one they currently play for, I’ll be pretty surprised. If I had to handicap the chances of any one player on this list moving on, I guess it would be Roethlisberger, but it’s sort of like picking the most likely actor from a SyFy movie to win an Oscar for the role. Manning’s situation is basically the same as the above quarterbacks, with the caveat that he’s not very good anymore and his team might draft a quarterback this year. It’s not that hard to envision a scenario where the Giants let him go. Why another team would give Manning a starting job is another question altogether, but at least it’s not as out there as the other guys. Now is where we get to the interesting names. The Buccaneers pretty clearly aren’t all in on Winston, wavering on him as the team’s current and long-term solution at the position. As such, his 2020 is going to be basically another trial year, and with new head coach Bruce Arians in the fold, he’ll have every opportunity for big-time fantasy success. Fantasy isn’t reality, though, and if he can’t match his monster numbers with good real performance, he might hit the markets. It’s hard to imagine anywhere with a coach like Arians and a pass-catching group like Mike Evans, Chris Godwin, and O.J. Howard having a QB job available, so the chance Winston moves on in free agency means his dynasty stock gets dinged a little. You have to figure Gordon is a prime figure for at least a franchise tag if he continues performing like he has, if not an agreement on an extension. If he does reach free agency, though, he’ll be a 27-year-old at least one 1,000-yard season under his belt. He’s scored at least 12 total touchdowns each of his last three years and was PFF’s highest-graded rusher in 2018. His stock can only be hurt by a team change, just because his current situation is so amenable, but it’s hard to imagine him moving on. Henry had a breakout 2018, but it was really just a breakout home stretch of the 2018 season. He was the No. 39 PPR running back entering Week 13, sitting at 474 rushing yards. Then over the last month, he put up 585 rushing yards and was far and away the No. 1 back, 16 points ahead of Damien Williams in second. Basically, with a month left in the season, it wasn’t far-fetched to expect the Titans to move on from Henry after 2019, but now it suddenly seems like a dodgy proposition. 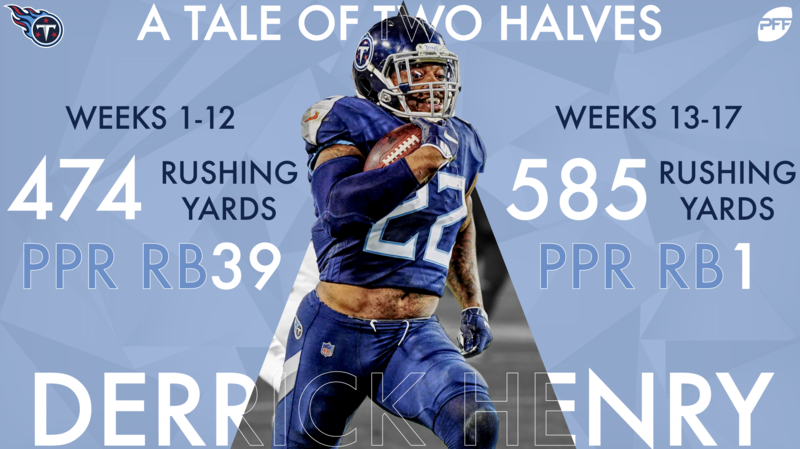 Any moving on Henry does do, though, would probably be bad for his stock; not many teams are as run-dominant as the Titans, and that offsets the damage Dion Lewis’ presence does. 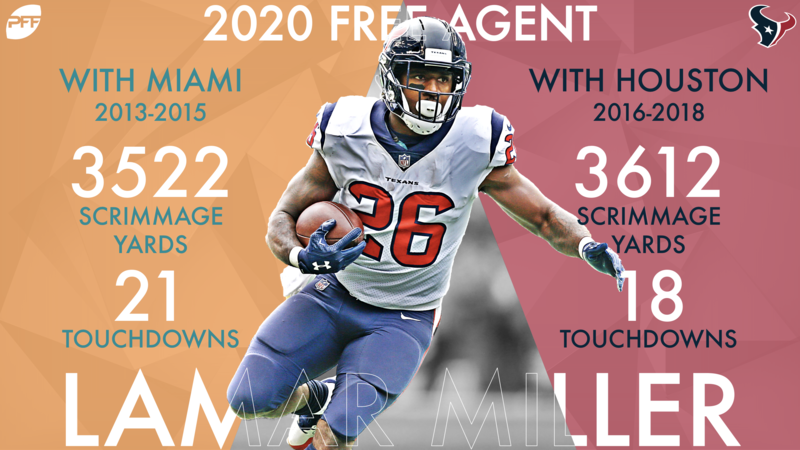 Miller was supposed to have become a stud in Houston, free from the reins that were kept on him in Miami. Instead he’s been … fine. He averaged 1,174 scrimmage yards and 7 touchdowns over his last three years in Miami; he’s averaged 1,204 and 6 in his first three years in Houston. It’s hard to imagine there’s another level to Miller left, and he’ll be 29 when he joins a new team. He’ll find a gig somewhere in the league, but he’s not going to be anybody’s bell cow. His dynasty stock is dropping, and it’ll drop no matter where he lands in 2020. Howard’s struggles as his career have gone on are fairly well documented — he averaged 5.2 yards per carry as a rookie in 2016, 4.1 in 2017, then 3.7 in 2018 — but in his defense, the Chicago O-line hasn’t done him many favors in recent seasons; his average yards before contact have gone from 2.2 to 1.6 to 1.0 last year. There are already rumors the Bears will cut bait on Howard even before 2019, but assuming he stays with the team, it’s hard to imagine him back for 2020. Howard’s never going to be much of a receiver, but if he lands somewhere as someone’s early-down option, he’ll have some increased value. Hunt signed a one-year deal with the Browns to try to rebuild his NFL stock after it fell off for completely off-field reasons. He’ll miss eight games in 2019 and will be behind Nick Chubb on the depth chart after that and keep his nose clean, he’ll have as good a shot as anybody as being a bell-cow back somewhere in 2020. It might leave a bad taste in your mouth, but if you’re up for it and aren’t necessarily pushing your chips in for 2019, Hunt could be a good long-term investment. Drake’s average yards after contact per attempt were a perfectly fine 2.6 across 33 carries in 2016, and a perfectly fine 2.7 across 120 carries in 2018. In between, over 133 carries in 2017, Drake’s average was somehow 4.3. At a minimum of 100 carries, only Nick Chubb’s 4.5 in 2018 has been higher in the PFF era. Despite that, Drake ranks only 36th in carries over those two years, behind guys like Matt Breida and unemployed-for-a-while C.J. Anderson and barely ahead of Cam Newton. He’s probably never going to have after-contact numbers like he managed in 2017 again, but he’s got to land in a spot more amenable to fantasy production than Miami in free agency. Dixon, a personal favorite of our Scott Barrett, has struggled with health and suspension so far in his career. He’s played only 18 games across his three seasons, only six over the last two. But when he’s been on the field, he’s been a tackle-breaking machine; he led the league in forced missed tackles per attempt in 2016. Hunt led the league in 2018 at 0.24, but only because Drake didn’t have enough attempts to qualify, as his number was a whopping 0.30 … exactly what it was in 2016. Mark Ingram and Gus Edwards are in Baltimore, as is Lamar Jackson. Dixon’s dynasty stock can only rise when he reaches free agency. Counting the playoffs, Ekeler has topped 35 offensive snaps in a game in four of 32 career games. In those games, he has 129 rushing yards on 40 carries (3.10 yards per carry). In all his other games, he has 685 yards on 113 carries (6.06). Direct correlation? Maybe, maybe not. But as big a fan as I am of Ekeler (and I’m a big one), he’s not a guy I’m making a bell-cow back. His stock is what it is. He’s a flex option with DFS or best ball upside.